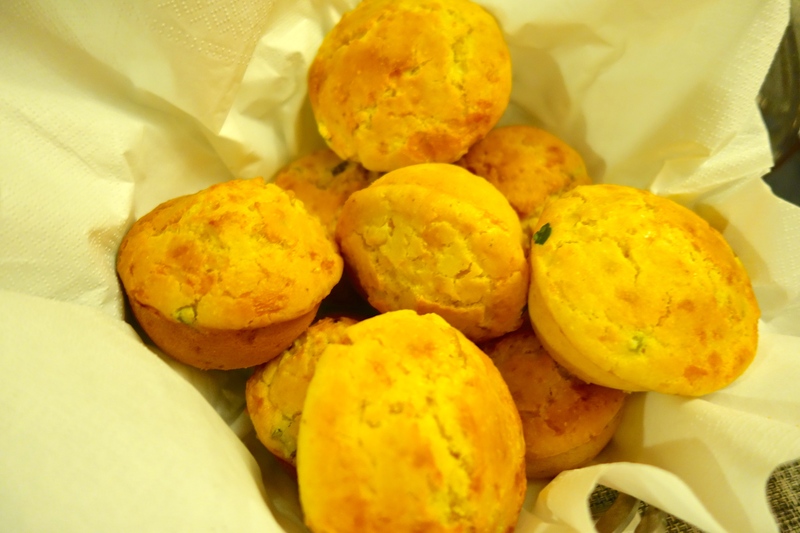 As an accompaniment to my Oven-Cooked Baby Back Ribs, I make these tasty little morsels – I have always loved corn bread and never would have thought that it is so simple to bake, and the turnout is quite professional. I first tried the recipe when I was tasked to cook an American-themed meal for foodie friends, starting with Crab Cake Sliders, followed by Cioppino (fish stew) and ending in Pecan Pie. I was lucky to find the recipe in Hong Kong’s Crave Magazine, which ran a feature called ‘Our Best ever Recipes’ in it’s 33rd issue. It featured recipes from their chef panel and other local Hong Kong chefs, one of which was Lori Granito (read this super interesting article about her culinary kickstarter company, Kitchen Sync) of the private kitchen, Magnolia, and also catering company, Go Gourmet. Many may find Magnolia’s food quite heavy (it is after all New Orleans style Cajun and Creole cuisine – think ribs, seafood gumbo, jambalaya and pecan pie), but I have always LOVED their ribs and their corn bread. Lo and behold, I found the recipe in Crave magazine – and it works like a charm. ♥ Preheat the oven to 180°C/350°F. Mix the 5 dry ingredients in a large mixing bowl. ♥ In a separate bowl, mix 3/4 cup of the cheddar cheese and the rest of the ingredients. Combine the wet and dry ingredients, whisk thoroughly. ♥ Butter the muffin tin and fill each space 2/3 full with the muffin mix, top each one with the remaining cheddar cheese. ♥ Bake for 25 minutes or until golden brown. If you are making mini-muffins, bake for 15-18 minutes, or until golden brown. If you have some leftovers and want to heat them up, I find a good way to keep them moist is put them in a bowl covered with a moist kitchen towel and heat in the microwave for a minute. ** For those doing their shopping in Hong Kong, I buy the jarred jalapeños at C!ity Super (HK$ 33) and the cornmeal is available at Oliver’s Delicatessen (HK$28). looks delicious! are these spicy? They are! I used one chopped jalapeno, bottled not fresh (this brand: http://www.foodservicedirect.com/product.cfm/p/31113/Trappeys-Whole-Jalapeno—12-ounce-pack.htm), and the muffins had a hint of jalapeno flavour, but they weren’t spicy. I suggest adding 2-3 if you want them spicier.